How about one pint-sized yet passionate lady in her second and most ambitious one-person show yet? 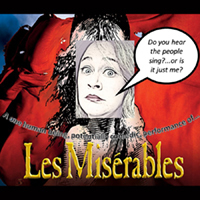 Alli Perlov will aim to make you laugh, cry and sing along with the best of Les Mis through an original comedy/parody lense. All your favourites will be there including Fantine, Eponine, Jean Valjean and Javert (guaranteed better than Russell Crowe in the 2012 film) and Cosette as played by a kazoo. Bad acting + bad singing = spectacular show – correct? In this case, yes and absolutely. The traits not listed above are charisma and wit, both of which ooze out of the performer. Actor Alli Perlov, a full time drama teacher by profession, readily admits that her rendition of Les Mis is a butchering of the theatrical productions—and by all accounts, that’s true. However, her delivery style adds a dimension to this show that makes it more fun than the original can ever be. Part musical, part narrative, part critique and all high-spirited, exuberant energy, Perlov charms the audience through gimmicks, gags and visuals. Laughs permeate throughout the show, with moments of honest side-splitting roars. This goes off as one of my Fringe favourites of all time.